Today is Doncaster’s brand-spanking-new Mayor‘s first day on the job, and his first engagement of the day was an interview with BBC Radio Sheffield‘s Toby Foster. I hope Mayor Davies didn’t think he was in for an easy ride for his first official interview, because that’s not what he got. Over the course of seven and a half minutes, Toby Foster took Mr Davies’ election manifesto and pulled it apart, pointing out that he doesn’t know what ‘PC jobs’ there are in the council (Mr Davies’ reply being “the things that are usually advertised in the […] Guardian”), that he can’t cut translation services for non-English speakers (Toby Foster: “It’s more than likely illegal, isn’t it?”. Peter Davies: “I dunno”), and that he hasn’t even though of the possible benefits of funding minority events such as the Gay Pride march (when asked how much money went to funding it, he replies “Haven’t got a clue, I haven’t looked into… I haven’t got the details”). On top of this, he admits that his cuts will mean job losses – which I’m sure the electorate of Doncaster will be happy to hear. Click here for BBC’s Listen Again (at about the 1hr 57min mark), or here for just the interview (which I hope the BBC won’t mind me putting here). For those who can’t listen to the interview, I’ve transcribed the whole thing below. Doncaster is my home town, and it’s also where I’ve lived for all of my (almost) 28 years since I popped (!) into being at Doncaster Royal Infirmary in the summer of 1982. For those unfamiliar with geography in the north of England, Doncaster’s a fairly large town (with a population just under 300,000) in South Yorkshire. It’s also the source of many a political furore at a local government level, and has been since the Donnygate scandal of the mid-to-late 1990s. The fun never stops in Doncaster, and today is no different – the Audit Commission has published the results of their snap Corporate Governance Inspection, carried out over the first few months of this year. It’s a frank assessment of the state of Doncaster Metropolitan Borough Council, and it’s not pretty. 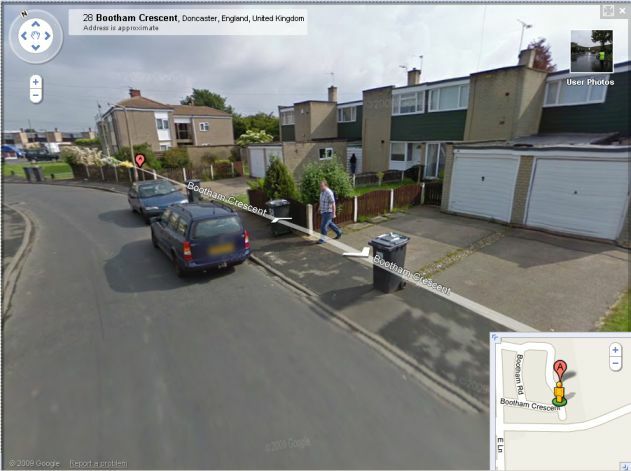 Google Streetview in the UK… updated!